On January 5th, 2018 new FEMA Flood Maps went into effect for St. Simons and Sea Island. This may allow you to significantly lower your flood insurance premiums. To qualify, you will need to provide your insurance carrier with a recently prepared Elevation Certificate in order to identify the correct Base Floor Elevation of your cottage. Homes that were built prior to 1983 and were under the required Flood Elevation could see a significant change in Flood Insurance rates. Call your insurance carrier to discuss how this affects your home and then call me to discuss how this impacts the value and marketability of your home. Also, I'll gladly recommend a good local surveyor(s) that can prepare the elevation certificate. This was my backyard and the water rise during Irma. Fortunately, the water stopped before getting near our house. We did not have any water damage to our home and the dock was not damaged. In our case, the water stopped along the 8' elevation contour line as depicted on the Elevation maps provided by our Glynn County GIS. 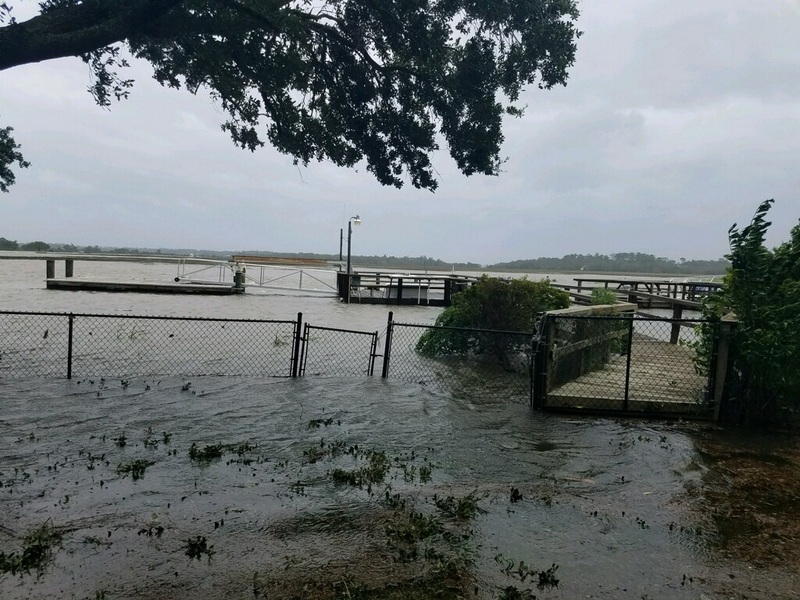 The new FLOOD MAPS are out and in 2018 many homes on St. Simons and Sea Island will change to a different flood designation. My home is going from an AE-12 to an X zone. The new designation will make it easier to get affordable flood insurance. Above is a snapshot of NEW FLOOD MAP for Dunbar Creek Point (along Dunbar Creek). The darker orange indicates an X zone. Below is a snapshot of our CURRENT FLOOD MAP for Dunbar Creek Point. Page Aiken is a 7th generation native of St. Simons and Sea Island, a 30-year real estate professional with international and national sales experience ideally suited for Sotheby's International Real Estate sales. He represents both sellers and buyers of fine homes on St. Simons and Sea Island, Georgia.